Pancakes are my first food memory. I’m one of 8 children (all girls, wrap your head around that) and one of about 27 cousins (I don’t even know the actual number) which made alone time with my grandparents really special. The spring after I turned 4, I spent a Saturday night in a My Little Pony sleeping bag on the floor of my Grandparents bedroom, falling asleep to a wall mounted TV playing Wheel of Fortune. When I woke up, my Grandpa (Papa) was already gone. He was an artist that had done quite a bit of the original artwork for the Madonna Inn, looked a lot like Desi Arnaz and had a heart of pure gold. My Grandma packed me into her 1980’s Cadillac with overstuffed seats that felt a lot like recliners and headed for the San Luis Obispo community center’s Pancake Sunday. My Papa was the “featured chef” and the hall was packed. My Grandma shuffled me past tables of seniors, wide eyed and waving at the tiny blond 4 year old. I was like a celebrity, I was Harry Tregarthen’s granddaughter and I was a “baby” to these ladies who just wanted to pick me up and squeeze my cheeks. My Grandma and I join a round table with four other older ladies. “Your Papa makes the best pancakes, you know,” one of the ladies was actually talking to me, instead of about me, that was new for me as a 4 year old, “That’s why this place is so busy. Last weekend, when Sal was cooking, only half full. Today, standing room only!” I didn’t know what “standing room only” meant, but I knew it was good. “They must be good pancakes!” It’s all I could think to say, but the thing about being 4 is that as long as you form a coherent sentence and say it with enthusiasm, people laugh. And they did, these ladies were my crowd and I was on fire. “Do you know the secret ingredient is?” She asked, clearly as excited with the banter as I was. “Sugar? !” I said, because I’m 4, and that’s pretty much my life. I hit again, they were rolling. I could have mic dropped. Once she caught her breath the older lady let me in on the secret, “7-up! Can you believe it? Instead of milk!” I didn’t know how to make pancakes, or even that milk was a part of the process but I did like 7-UP. He was brilliant, I couldn’t believe it. He had put soda in pancakes?! At 4 years old, before I had even seen a recipe, let alone followed one, my Papa taught me that you should experiment. Break the rules, do your own thing. Pancakes are a great recipe to experiment with. So basic, and with so many places to go. I don’t drink soda anymore, so I never have it on hand, but when I did I always used it in pancakes. It makes them fluffy and light. But now, even though I’m back to using milk, I like to experiment. Pancakes are like a canvas, nearly ever ingredient from sweet to savory somehow work in a pancakes. And to this day, I always think of Papa when I make pancakes. Add all streusel ingredients to a food processor, process until crumbly. Set aside. In a bowl add the flour, salt, brown sugar, baking powder, brown sugar, cinnamon, and nutmeg, mix until well combined. Make a well in the dry ingredients, add the milk, egg and vanilla, stir until just combined. Add the apples and stir. Heat an electric griddle at 350 or skillet over medium heat, coat with cooking spray. Drop about 1/4 cup of batter on the hot griddle, top with 1 to 2 tbs of streusel. Cook until the edges start to look dry, and the underside is golden brown, about 3 minutes. Flip and cook on the other side until cooked through, about 2 additional minutes. Plate, top pancakes with remaining streusel. One thing I rarely make is pancakes. I dont know why, but I just don’t. Well, okay I do. Because I would have to babysit them at the stovetop and usually I am just not that dedicated in the morning. Yours are gorgeous! I use an electric griddle and it’s amazing. SO worth breaking out for pancakes because you can cook ten at a time. SO much easier than one or two at a time in a skillet and then when your done the first few are already cold. These look like a fun variation on normal pancakes. And jusy in time for Shrove Tuesday. You’re so clever! Funny about the Madonna Inn. I’m from San Luis Obispo and my brother had his rehearsal dinner there. I’ll have to look more closely at the art next time I’m home. I love that place! My Grandpa actually painted most of the murals in the hotel rooms and he did the stained glass work and even used to hand paint the billboard when you drove into town. I don’t make pancakes nearly enough. I’m more of a breakfast for dinner gal and I think these would make a wonderful dinner! What a great memory of pancakes! I love this. I think my first food memory is chocolate chip cookies, also with my grandmother. I adore the streusel on these! Grandmas are always good for cookies, aren’t they?! I’m pretty sure Food Blog Grandkids will get cookies on whole new level! I love pancakes and do not make them often enough. 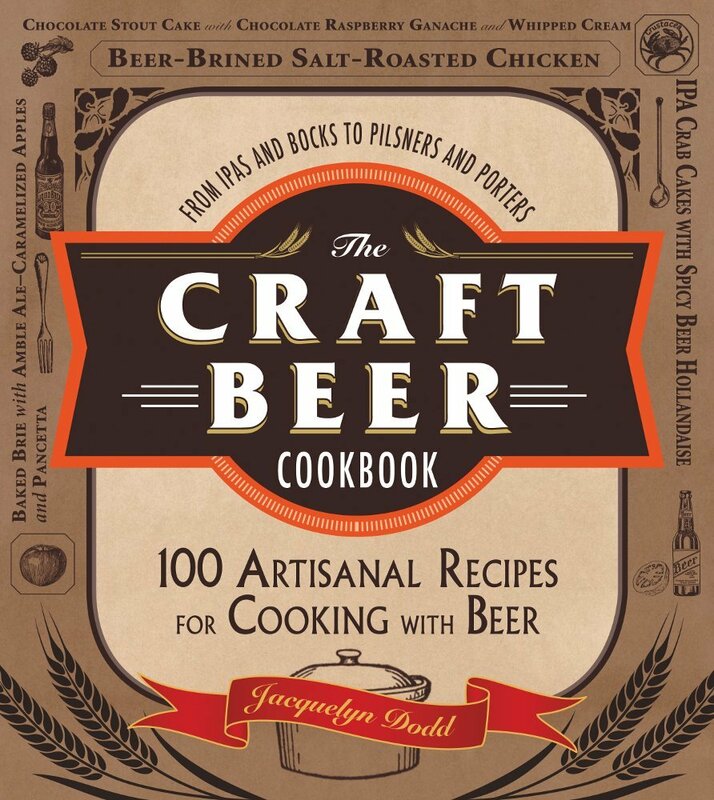 This recipe sounds like it would be a home run in my household! yum! 7-up in pancakes?! That is all sorts of awesome. 🙂 Sounds like an awesome guy. These pancakes look divine, too. I love the idea of streusel on top. What a great memory! I come from a family of 5 children, all girls – I imagine your dad was a special, extra sweet sort of man just like mine to deal with it 🙂 These pancakes sound and look wonderful! Great post! You come from such a big family! And these pancakes look absolutely amazing. If only I could wake up to this every morning! Way to remake a dessert and make it acceptable for breakfast! It looks scrumptious. What a special memory! 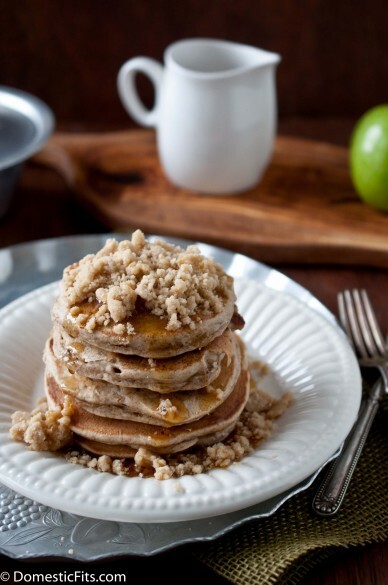 Love that you topped these pancakes with streusel! You painted the story about your grandfather so beautifully. I felt as if I was there! And the reason why I love pancakes so much is because there are so many variations. woah – i’m still trying to wrap my head around you growing up with 8 girls!! oh man, that is insane but kind of cool – if you all got along 😉 haha, i love the memories that these pancakes bring! they look SO good with that streusel topping!! Wow, there must have been a lot of fighting and hair pulling in your house growing up with all those sisters! What a great story this was. I am so curious to now try putting 7-Up in my next batch of pancakes! It really is great. They turn out really fluffy and light. I need to get a Soda Stream and try it with homemade soda! Cheers for big families!! I’m one of 8… 5 girls, 3 boys. 🙂 Only ours are over a 24 year span. My mom is super woman! I rarely crave pancakes but you just managed it. Absolutely delicious looking. And thanks for sharing about your grandparents, they’re very special memories I know! Wow, 24 years of having babies?! I can’t even imagine! That’s a lot, as a mom, I now can not imagine having more than 2. One of 8?! Whoa… and I thought being one of 5 was a big deal! 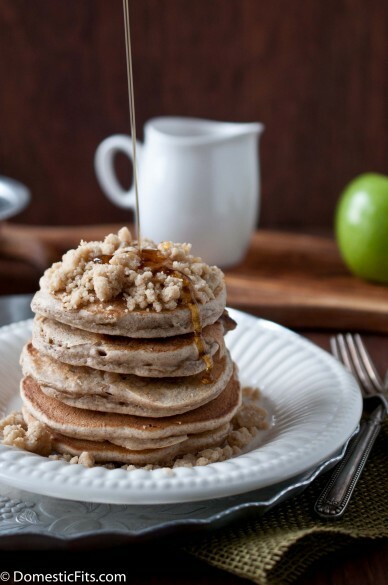 You’re a champ 😉 And these pancakes look divine! We were just saying how it’s been too long since we’ve had a pancake morning. I didn’t think it was a lot at the time, but now that I have one kid, I think that many kids is pure insanity. I can barely do one, and I still feel like I’m not a good enough mom! One of 5 is still a big family. Now, as a mom, I think 3 is too many! These might just be the most perfect pancakes!! Ever! I’m one of four girls and I thought that was a lot of girls under one roof, BUT 8… my dad would’ve stroked! On a serious note, Jackie… I always enjoy reading your posts… this one especially tugged at my heart strings! LOVED IT… and the shot with the syrup cascading down, my heart about stopped! These look like the ultimate warm and comforting dish for weekend brunch! 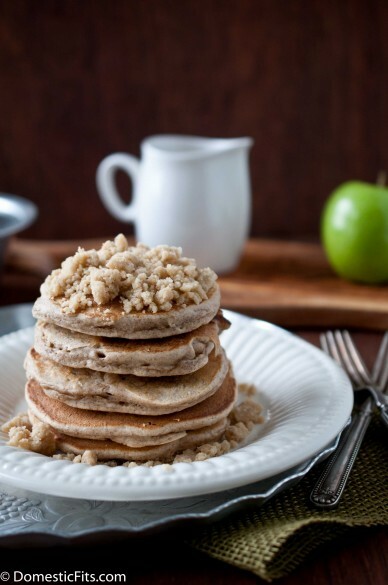 I am a fan of anything involving streusel, but never thought to add it to pancakes. Yum! 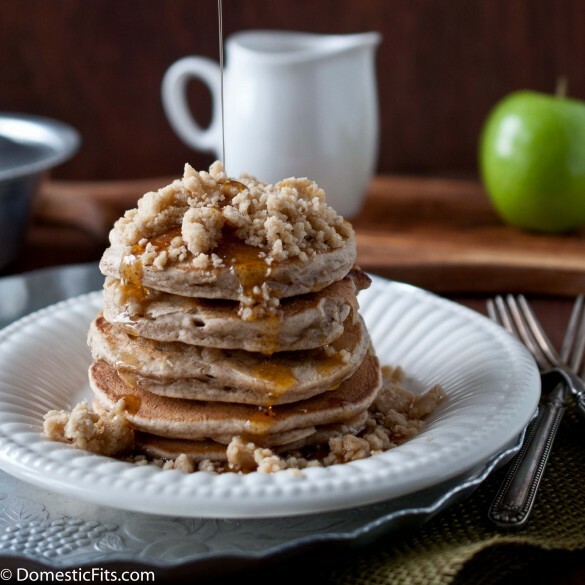 Beautiful post–and yummy looking pancakes! I love the streusel!! 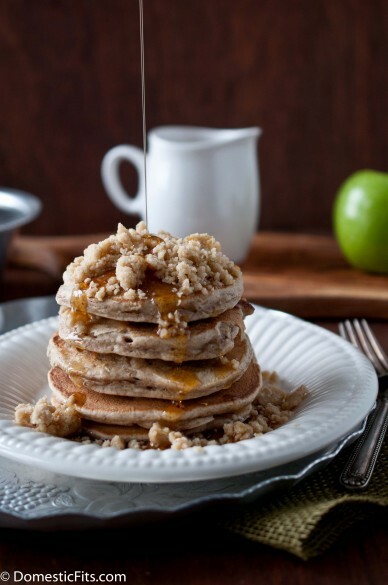 Such a great twist on pancakes!